The Dutch Flamenco Biennal is a biennial international dance and music festival in Amsterdam, Rotterdam, The Hague, Utrecht, Eindhoven, Maastricht, Amersfoort, Groningen, Purmerend, Ghent and Antwerp with a genre- and discipline-transcending festival program of high-quality artistic signature in which diversity and multidisciplinarity is paramount. In the years between two Biennal editions we organize concerts and performances under the title Flamenco Intermezzo. 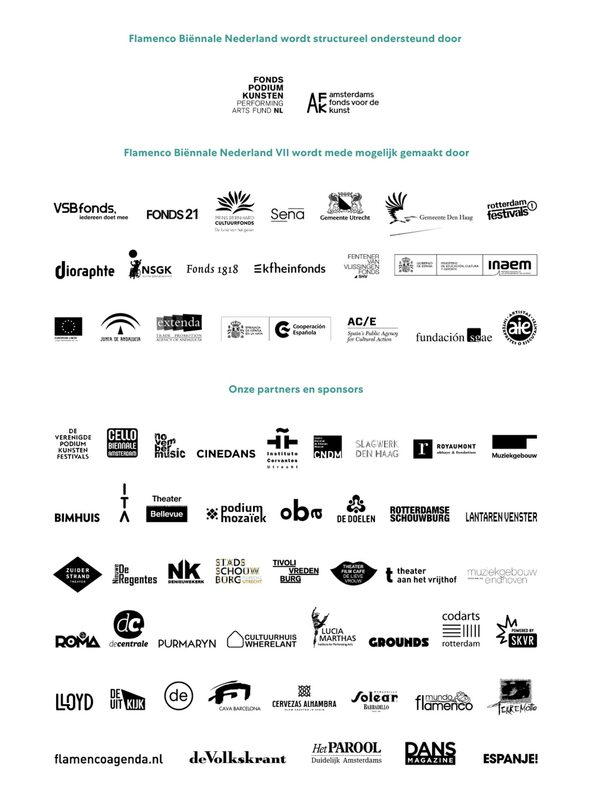 The Flamenco Biennale was initiated and organized by the PerpetuumM Foundation, and was founded in 2006 by Dutch hispanist Ernestina van de Noort. The Foundation aims to spread Spanish, Iberoamerican art and culture in the Netherlands (and occasionally in Belgium). We do this, among other things, by organizing the Flamenco Biennal in the Netherlands, in close collaboration with concert halls and theatres. The PerpetuumM Foundation wants to create a meeting place for music and dance explorations with its activities. Our main objective is busting the boundaries, looking for new perspectives and cross connections within professional performing arts. In addition, the foundation aims to highlight traditional cultural expressions and contemporary art forms from the Iberian and Latin American continent. The PerpetuumM Foundation collaborates with artists from the countries in question, organizes exchanges of Dutch, Spanish and Iberoamerican artists to promote intercultural communication and dialogue. In twelve years, Flamenco Biënniale Nederland has become the brand name of an adventurous, pioneering and prestigious arts festival that shows the 'State of Art' in flamenco and beyond, with a program that emphasizes the contemporary and open character of the art form. PerpetuumM Foundation is a non profit organisation and raises both government funds and private funds. All income, including the revenues of ticket sales, are fully utilized for the realization of the above mission. PerpetuumM Foundation / Stichting Flamenco Biënnale has received the status “charitable institution” (ANBI) from the Belastingdienst (Dutch Tax Authorities).